From System 35 Trio Gantry Convert your exhibition Gantry stand into a smart Gazebo, come promotional marquee tent. We are now able to offer a specialist conversion roof canopy kit for some trussing systems. 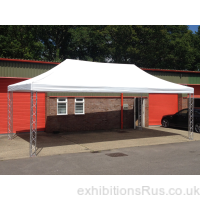 With relative ease you can now fit a canopy and or side walls to your truss system making a perfect external event or party tent for any outdoor event or application. A double use for truss enabling even more use of a great Trio or Quad truss system. Ideal to give a little shade or shelter from sun and rain for those external events. Expect a supply time of 1 week, call to discuss you specialist needs 01256 768178.